Good for kids? Hell yes! Mathew: You know, just the other day I was thinking, "I wonder if there will ever be a game as good as Angry Birds-"
Helm: I hate your games. They are a foolish waste of time. Mathew: Then how come I keep catching you playing them? Helm: You do not "catch" me doing anything. "Catching" me suggests a level of intelligence and stealth far in excess of what your puny brain and massive bulk can muster. Mathew: But you don't deny that you play the games. Helm: Fine, wretch! I do not deny it. After a long day spent trying to flog your flaccid form into shape, I occasionally relieve my intense frustration and rage with a few moments of playful violence. T'is often the only thing that stops me killing you myself. Mathew: If you could kill me yourself, you would have done it a long time ago, dude. But enough of this blather. Review the game! Helm: My powers are beyond your comprehension. Mathew: Working an iPhone is not exactly beyond my comprehension, but, whatever. Mathew: -in order to kill enemy soldiers. It's kind of an update or a remake of an earlier game called Crush the Castle that was released before Angry Birds and was maybe even kind of an inspiration to the Angry Birds dudes. Helm: I like Crush the Castle. It reminds me of actual warfare. 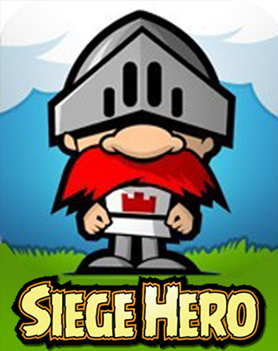 Siege Hero is fun, but silly like Angry Birds. Mathew: Yeah, that's kind of the point. I like Crush the Castle too. It's awesome in a Monty Python's Flying Circus kind of way. But it's kind of hard to replicate the effects of your trebuchet shots and get consistent destruction. Mathew: Yeah, okay. Off topic. So Siege Hero is super addictive fun. It's stylized and cartoony, similar in basic look to Angry Birds, only not quite as oddball in that respect. I think the Angry Birds guys did a great job of building weird, non-sequitur personality into all the characters and settings and things so that it's really amusing. I mean, it's flightless birds fighting soldier pigs who have stolen their eggs. Often, in the old west and places like that. Even the sound design is funny. Siege Hero is more straight forward and kind of makes more sense, which is a little bit of a drawback for me. It just doesn't have the same sense of humor. I mean, Siege Hero has cool sound, and I really like the Monty Python-esque music, but it's not as...I don't know...surreal. Helm: I actually prefer Siege Hero for the very reasons you name. Mathew: I think Angry Birds is better. Helm: T'is well known that you are an idiot. Helm: My chief complaint is the vast quantity of time you waste on these games. Mathew: Dude. It's not wasted time. I have to maintain my rankings. That doesn't just happen, you know. You want to be the best, you have to put in the time. Helm: And if you want to be Mathew Blurdy, you have to put in the Twinkies, pizza and soda pop. Mathew: Really mature, Helm. Really mature.